Over this last weekend, The Middles packed their bags, traveling with the Rotan Yellowhammer Marching Band to the State Marching Contest in San Antonio. In his traveling-by-bus wisdom, the band director restricted the bag limit of the band members. I was amazed at how much the girls were able to cram into the few bags they took, which got me thinking about how much I wish I had the authority to enforce such protocols in my family’s travels. As one can imagine, with 9 people in the family, we do not travel light. Even the baby has more than one bag, although one of those is a diaper bag. And just on a side note here: my wife made fun of me when I came home with a diaper bag I was quite proud of. Not some dainty thing with minimal cargo room, no. I brought home the type of bag a swat team member might carry for necessary tactical gear. Right now there are moms laughing out loud, or rolling their eyes and shaking their heads saying, “Men.” Conversely, there men reading this, also laughing, but saying, this guy is a genius. 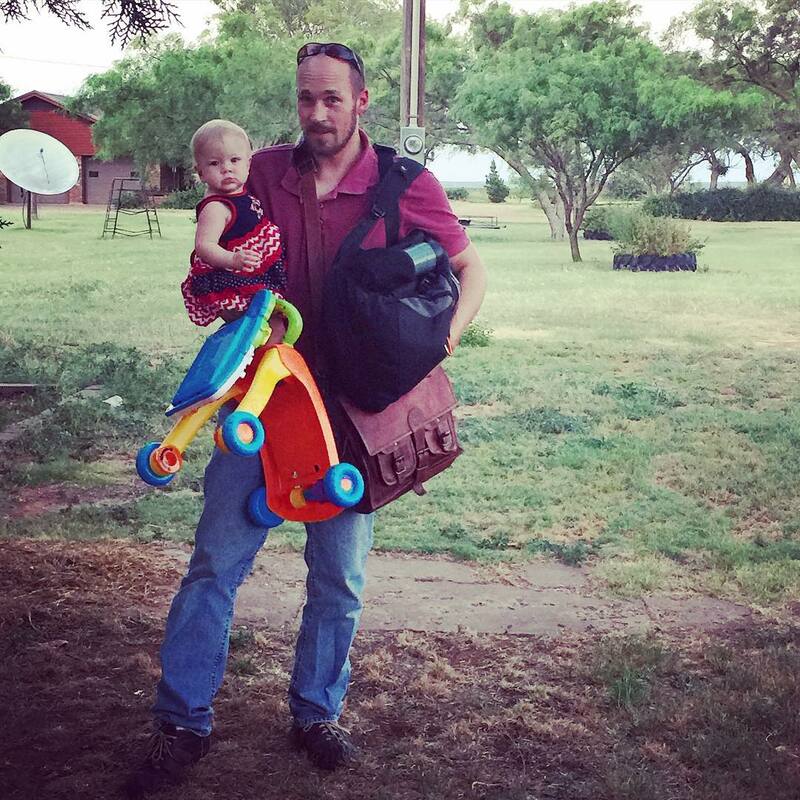 Laugh if you want, but I’m telling you: You will not find a better container to transport the essential items necessary for infant field operations than a SOG tactical bag. Baby wipes, diapers, Sippy-cup or bottle, blanket, extra clothes, burp rags, toys, pacifier, snacks, ointment, powder, lotion, all within its own zippered compartment. And with the removable, un-foldable, padded pistol pouch, we have a nice comfortable place to lay the baby while we change them. After all: even barbarians understand a baby needs a comfy place to lay their naked bum. It is easy to draw the conclusion, even a simple trip to town can be daunting for the luggage-packing department, i.e. me. We live some 15 miles outside of town; therefore, we like to make sure we have everything we need when we head into town for work and school. It was just such a return from work trip I was reflecting upon when I had the wish to establish a bag limit. We pulled to a stop under the carport. Everyone hopped out and grabbed their stuff. I ducked into the backseat and extract the baby, and then swung around the back of the car to retrieve work items and baby gear from the rear hatch. We all moved around one another in some kind of chaotic ballet. I ran down the list of items of my responsibility: Satchel? Check. Backpack? Check. Laptop case? Check. Incredibly efficient and totally functional diaper bag? Check. Baby’s push toy? Check. Baby? Check. I closed the hatch and was plotting a course for the front door, when I heard the laughter. I look up to see my wife on the porch, a single purse nestled in the crook of her elbow, cell phone in one hand, and the index finger of the other poised ominously over the phone’s screen. Maybe she was texting, maybe she was Facebooking, Instagraming, Twittering, or otherwise preparing to post the picture she was undoubtedly about to take. And why not capture the moment. While she stood there comfortably on the porch, I looked like a Himalayan Sherpa. Bring it on Everest. My bags are packed. Which is true in a sense. My life with my girls is very similar to my life as a firefighter. The briefing is always vague, and I never know when I’m going to get toned out. I just need to be prepared, and have my gear in a state of readiness, as I rarely know what’s going on. My wife says this is because I don’t listen, and she’s probably right, but I like to hold fast to a different theory. I think during certain times of the day the isotope content in the air builds up, momentarily disrupting the frequency of the female voice, rendering it inaudible to the male ear. During times of sun spots, solar flares, and some phases of the moon, the effects of this anomaly can be increased, sometimes spanning several hours or days. Groups of men can also create a bubble of frequency disturbance, especially if said frequency is received via telephone. I call this the T-effect, or testosterone effect, due to the heightened levels of testosterone men experience when performing macho acts with other guys, especially close friends. That’s the theory I’m going with anyway. But I know this, that group of guys can pack all they will need for a weekend trip in a Ziploc freezer bag. 2 pair of socks, 1 pair of underwear (optional), toothbrush, toothpaste, deodorant, and a brush for those who still have hair: packing complete. We are men and require very little space. Which is a good thing, because cargo room is a limited commodity when traveling across This World of Hurt.